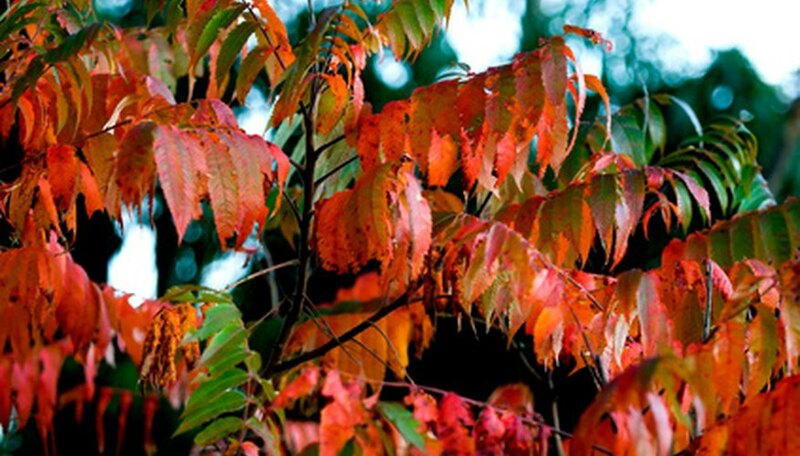 If you have yard that is too small for a tree but you want brilliant red fall color, plant shrubs with leaves that turn red in autumn. Some are suitable as individual lawn specimens--ideal for small urban yards--but most are adaptable enough to be used as foundation plantings, living fences, windbreaks or as components of hedgerows. A shrub with a loose, open growth habit, the branches of staghorn sumac (Rhus typhina) resemble deer antlers, which accounts for its common name. Sumac is hardy through U.S. Department of Agriculture planting zone 3, but may suffer winter dieback to the roots in severe winters with little snow cover. The bright red autumn leaves of staghorn sumac can be seen lining the banks of urban highways. They are often used as erosion control on hillsides. Sumac will grow to a mature height of 10 to 15 feet with a spread of 10 to 20 feet, depending on growing conditions. Plant staghorn sumac in full sun or partial shade. Although it is adapted to most soil types, it prefers acidic soil. The roots and inner bark can be used as a dye, according to North Dakota State University Extension. The cultivar 'Compactus' is the most widely grown euonymus (Euonymus alatus 'Compactus'). Its flaming red fall color is the source of its common name “burning bush.” Burning bush grows slowly to a height of 10 to 15 feet, forming a vase-shaped shrub that is easily pruned to maintain a smaller size. They grow well in full sun to full shade, but prefer moist, well-drained acidic soil when planted in full sun. Euonymus grown in full shade will show fall color that is pink-red to faded yellow. Burning bush can be planted as a specimen or foundation plant, or as part of a windbreak or hedgerow. Native to Asia and the interior of China, burning bush is hardy through USDA zone 4. Growing to a mature height of approximately 8 feet with an equal spread, gray dogwood (Cornus racemosa) is widely planted along foundations, in mixed borders and at waters' edge. Along with red, its fall color also shows green and purple. Its thin stems are a dark red to purple-red in color and provide winter interest in the landscape. The bark on its stems changes to gray as it matures and resembles the bark of the flowering dogwood tree (Cornus florida). Grey dogwood will adapt to sites that are either wet or dry and will even grow in poor soils. Although it can become straggly with age, Ohio State University Extension horticulturalists note it will quickly recover from a rejuvenating pruning down to the ground.